With excellent transport links and located on the outskirts of the historic old town, this exceptional business centre provides serviced offices and a range of workspace solutions in an area popular with businesses of all sizes from high-tech innovators to long-standing healthcare companies. The workspace on offer here is available on flexible terms and represents exceptional value for office space of such quality and luxury. An attractive modern property houses this central Salzburg centre with flexible arrangements, reception services and on-site parking provided to all clients as standard. It is close to the historic Old Town and is near to motorway links. There is an excellent selection of restaurants, shops and banks within its locality, and the centre itself is located in a thriving commercial district. 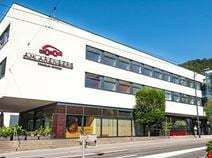 It stands in the heart of Salzburg's foremost corporate community.